In light of Occupy Toronto, I thought it worthwhile to highlight an earlier protest from Toronto’s history, when public demonstrations were considerably more desperate and dramatic. In the course of recent research on an unrelated topic, I found several newspaper articles describing the overnight occupation of Sir Adam Beck School during the summer of 1936, an incident since commemorated by a plaque. Etobicoke, like many parts of Ontario, had limited funds available to provide adequate relief for the unemployed during the depression, and during the spring of 1936 the township had been forced to impose severe cuts. These cuts included the termination of all relief for single men, as well as a lower level of compensation for those still included on the relief rolls. As a result, many of those who had been given government “make-work” jobs to earn their relief went on strike and demanded a restoration to the previous levels. Excerpt from page 2 of The Evening Telegram, July 9, 1936. After weeks of striking, and at the height of a major heat wave in July of 1936, it was decided that more drastic action was needed. This article in The Evening Telegram (click on it to enlarge) suggests that Sir Adam Beck School, in Alderwood near Horner Avenue and Brown’s Line, was being used as a centre for the distribution of relief vouchers, which in turn could be redeemed for food and clothing. On July 8, several hundred unemployed entered the school and informed relief officer C.C. Grubb that he was not allowed to leave. According to the article, “spokesmen told the officials that they meant no harm but were taking this measure to bring to the attention of the authorities the necessity for immediate action in restoring the relief cuts.” Grubb was soon joined by Etobicoke Reeve William A. Armstrong (the position of reeve being the equivalent of a mayor in what was then Etobicoke Township), and together the two men were held prisoner overnight in the school. Grubb and Armstrong were kept in the boiler room of Sir Adam Beck School overnight until the demands of the unemployed were met, which, by next morning, they were. Some of the protestors slept in the gymnasium or in hallways in an effort to keep cool. A Toronto Star article from July 9 adds that into the night, “the sweltering unemployed sang songs, played cards and discussed the situation until early in the morning when many of them slept out on mattresses and mats to get what sleep they could.” One of the protestors was reported to have needed medical attention after suffering a heart attack. Conditions in the boiler room were described as “filthy.” Grubb was quoted in the July 24 Toronto Star as saying “bread and lettuce was passed to us at 5 o’clock. We played several hands of euchre. Then the guards allowed the room to fill with workers and the air became stifling. The water pipes, through condensation, dripped water.” Grubb also claimed that protestors taunted him with both a hangman’s noose and a tar pot. Newspaper accounts suggest that Etobicoke did not actually have the money to restore relief levels, having already gone over their relief budget. Grubb and Armstrong seem to have been pawns, used by the protestors to impress upon the province the need for a greater relief budget in Etobicoke; upon capitulating to the crowd’s demands, the township had immediately transferred the problem of relief funding to Ontario. While certainly one of the more severe labour incidents in Etobicoke, this incident was actually one in a series of relief protests in Ontario in the 1930s, being neither the first nor the last. As such, there is no neat way to wrap up this incident, as the province and its municipalities continued to struggle with the distribution of adequate relief throughout the depression. Thank you to Denise Harris of the Etobicoke Historical Society, who provided me with additional material on this topic. Additional information from the Toronto Star for July 9, July 10, July 13, July 14 and July 24, 1936. In anticipation of this Saturday’s Tweed Ride Toronto, this is the final installment in a series of three posts looking at aspects of cycling in late-1800s Toronto. Part One is here and Part Two is here. Advertisement from the April 1887 issue of The Canadian Wheelman. Note the non-vibrating, hygenic saddle, "bifurcated to remove pressure from the perinaeum." In his 2001 book The Ride to Modernity: The Bicycle in Canada, 1869-1900 (University of Toronto Press, Toronto: 2001), Glen Norcliffe says there were eight cycling clubs in Toronto in April of 1892, with between five and six hundred registered members between them. At the time these clubs were predominantly the domain of young, middle-class men. Norcliffe notes that the increasing popoularity of the “safety bicycle” in the 1890s, the style of bicycle most popular today, saw a considerable increase in the number of women who were drawn to cycling, although most “wheelmen” at this time were men. While there are documented examples of using bicycles for commuting in Toronto in the 1880s, such uses were generally in the minority during the bicycle’s nineteenth century heyday, not really emerging until the late 1890s, when the price of bicycles dropped low enough to make them more available to the working class. Commuting by bicycle also became more practical as improvements in the condition of Toronto’s roads (i.e. paving) made urban cycling safer; amongst the various dirt road hazards mentioned by Norcliffe are sizeable stones, soft sand or muddy road conditions, ruts left behind by wagons, and the presence of horses. By the mid-1890s, the growth of urban riding prompted curious developments in the city. An article in an April, 1894 edition of The Evening Star reported on a deputation on behalf of Toronto’s bicycling community by enthusiastic Toronto cyclist Dr. Perry Doolittle, who registered his objections to a proposed cycling by-law which would restrict speeds to eight miles an hour and evidently require Toronto cyclists to carry lamps while riding. A few years later, newspapers reveal the introduction of Toronto by-laws requiring cyclists to stick to the far right side of the street and to stay off the sidewalks. Masthead of The Canadian Wheelman. 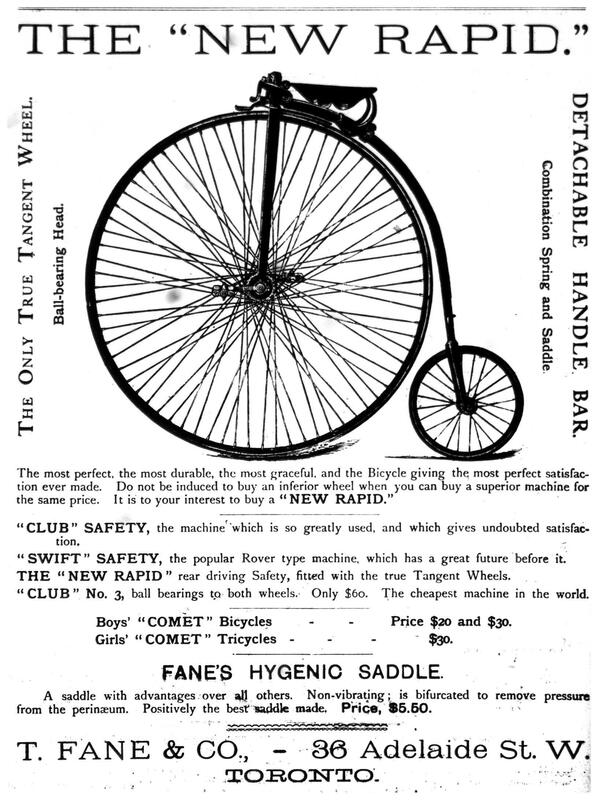 The 1880s and 1890s had been a time of great innovation in cycling, with improved models and new bicycling accessories being introduced each year, but by the early twentieth century the rate of innovation slowed. The middle-class cycling fad waned as the novelty slowly wore off. Much of the interest in novel and innovative technology shifted to automobiles; noted Toronto historian Mike Filey claims that Dr. Perry Doolittle himself was the first person in Canada to purchase a used car, bearing license #3. Bicycles were no longer just the exclusive domain of the middle-class. Attitudes towards cycling became less oriented towards leisurely social activities, and more geared towards practical transportation. William Humber’s Freewheeling: The Story of the Bicycling in Canada and Glen Norcliffe’s The Ride to Modernity: The Bicycle in Canada, 1869-1900 both offer excellent accounts of Canada’s bicycle history. Humber’s book covers Canada’s cycling history from the beginning up until the book’s publication in the 1980s, whereas Norcliffe exclusively looks at the nineteenth century. The nineteenth-century bicycle craze is also one of many interesting subjects explored in Christopher Armstrong & H.V. Nelles’ The Revenge of the Methodist Bicycle Company. All three of these books are readily available through the Toronto Public Library. Readers may also be interested in Jeffrey S. Murray’s article from September 2006 in Legion Magazine, and a recent piece by Simon Wallace for the Toronto Standard which focuses more on cycling in 1890s Toronto. In anticipation of this Saturday’s Tweed Ride Toronto, this is the second in a series of three posts looking at aspects of cycling in late-1800s Toronto. Part One is available here. Advertisement for an upcoming day of bicycle racing. From the June 1884 issue of The Canadian Wheelman. In the early 1880s, many Torontonians began joining cycling clubs; looking at 1880s cycling newsletters and magazines, it is apparent that these clubs engaged in a variety of “wheeling” activities. The most common events were riding excursions, in which members would go on day-trips to picnic grounds or cycle to a nearby community to visit another club’s facility. Several decades before the automobile, the bicycle enabled people to easily travel beyond their immediate area. As Toronto and other Canadian cities became increasingly urban, the bicycle offered idyllic access to the countryside at a much lower cost and greater convenience, when compared to horse-based transportation. Other regular cycling club events in Toronto included long-distance trips and cycling tours, with many clubs organizing visits to other cities, such as Ottawa or Montreal. While these trips would undoubtedly be slow-paced, many clubs also cultivated an interest in bicycle racing, which would take place in facilities built or altered specifically for the purpose. Numerous bicycle races were held in Toronto in the late nineteenth century, attracting competitors from all across the continent. These were often held on Toronto Island, and later at a facility in Rosedale. In Toronto, winter weather precluded cycling for several months of the year unless clubs had access to an indoor track. Some clubs embarked on other outdoor activities such as snow-shoeing so as to stay in shape for the start of the cycling season. The Wanderers, one of Toronto’s more prominent clubs during this era, organized a cycling trip in early 1884 on to Lake Ontario. Describing the excursion in The Canadian Wheelman, they wrote that “some good sport was had on the occasion, the only drawback being an accident which occurred with an iceboat, which collided with one of the bicycles, breaking it into several pieces.” This excursion may have taken place on conventional bicycles, or riders may have been on an “ice bicycle,” a hybrid between a bicycle and a sledge, specifically designed for use on ice. The Wanderers Bicycle Club, 1884. Original: Humme, Ludwig Eugen Julius Friedrich (1839-1891). Reproduced from the Toronto Public Library website. Part 3 in this series will be posted tomorrow. 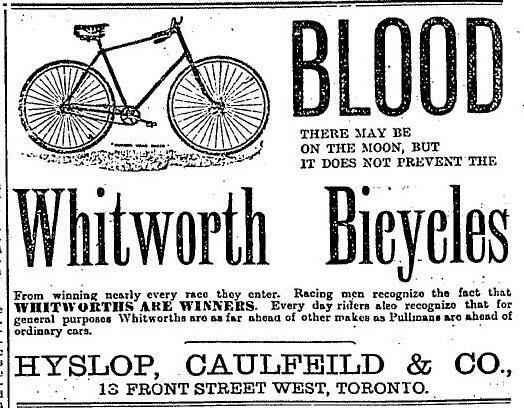 In anticipation of this Saturday’s Tweed Ride Toronto, this is the first in a series of three posts looking at aspects of cycling in late-1800s Toronto. Advertisement from the September 9, 1893 Globe. The first wave of bicycle interest reached Toronto around 1869, with the advent of a bicycle (or “velocipede,” as it then more-commonly known) nicknamed the “boneshaker” due to its riding experience supposedly being quite rickety and violent. The boneshaker was one of the first bicycles to really arouse interest in Canada, although its utility was ultimately limited due to several factors, including the relatively high retail prices and the poor condition of North American roads at this time. Original: Thomson, William James (1858-1927). Reproduced from the Toronto Public Library website. Members of the public were certainly keen to try bicycles for themselves, and in these years Toronto had other cycling tracks, including the Ontario Velocipede Rink in Yorkville, and the riding rink pictured here at Phoebe and Soho streets. Although this image has been reproduced in multiple sources, none of these sources have supplied any further information about the “Velocipede Rink and Baths” at Soho & Phoebe Streets, and there does not seem to be anything more known about it. These first cycling venues appear to have been very short-lived. The bicycle which one tends to associate with the late nineteenth-century, often known as a penny-farthing (the one with the disproportionately high wheel in front), arrived in North America in the late 1870s, and helped foster a more penetrating interest in bicycles amongst Torontonians. Other contributing factors at this time were the gradual paving and overall improvement of North American roads, various cyclists publishing accounts of their journeys allowing for circulating knowledge of good cycling routes, and innovative modifications to bicycles which made them more comfortable and, more importantly, more inclined to stay upright. Part 2 in this series will be posted tomorrow. For those wondering about the image at the top of this post, “Blood Moon” is another term for the “Hunter’s Moon,” the first full moon after the Harvest Moon. In 1935 there had also been a lunar eclipse in July; during many lunar eclipses the moon appears to be red. Either of these might explain the rather startling headline.